An uncle once took my family out for a meal to one of Delhi's Chinese restaurants, known for its Peking duck and a range of other dishes. Just as our food was being served, his wife pulled out a small tiffin box from her handbag and kept it next to her plate. All through the meal I saw her mixing her food with a pinch of the mysterious ingredient in the box. I later learnt it was chutney made of red hot chillies. She apparently got those fiery red chillies parcelled all the way from Manipur every season. It turned out that she cannot have her meal without a pinch or two of her chilli chutney. It’s not just my aunt who can’t seem to do without these chillies. People in the Northeast consider a meal incomplete if there’s no chilli chutney, preferably prepared with these red hot chillies, indigenous to the region. In Manipur, people call it umorok and sap malta among other names. In Nagaland, people lovingly refer to it as raja mirchi (king chilli), thus giving it a prominent position in their cuisine. To the Assamese, it is bhut jolokia, the name by which it is globally recognised. A variety of chillies of different shapes, sizes and varying degrees of heat quotient can be found in the Northeast, but the bhut jolokia is one of the most popular varieties. It grows in small shrubs and has been scientifically proven to be one of the two hottest chillies in the world. According to a report I read, it’s 400 times hotter than tabasco sauce. The chilli's taste and the spiciness may vary depending on the soil. For instance, in Manipur, the ones that come from Tamenglong district are far more fiery than those found in Churachandpur or Ukhrul district. Due to its extraordinary spiciness, one whole chilli is enough for a family per meal. The Nagas love it in most of their dishes, especially with bamboo shoots. The Manipuris don’t mind that fiery spiciness even if they have to eat sugar soon after a hearty meal spiked with the chilli, which is either dried or consumed raw. One common dish that is prepared with bhut jolokia in Manipur is ironba, a typical Manipuri dish which is prepared with different vegetables like potato, beans, bamboo shoot, all of which is mashed with this chilli. Students studying out station will invariably carry a bottle or two of the chillies preserved in mustard oil and salt. I have it in my kitchen and use it sparingly. Some people pickle it; some make a paste or chilly flakes out of it and use it for cooking. These chillies have multiple uses. Sometimes its aroma is extracted for use in cosmetics, confirms Leena Saikia, who runs the Frontal Agritech Private Limited in Assam and is the only known professional chilli grower in the region. She has clients who place orders for the chilli for several purposes other than culinary. Some of her clients use it for cosmetic purposes, some for preparing pepper spray, used for self-defence. In the Northeast, a kilo of the dried chilli costs Rs 1,600 to Rs 1,700. In Assam, vendors in local markets sell five chillies for Rs 10. 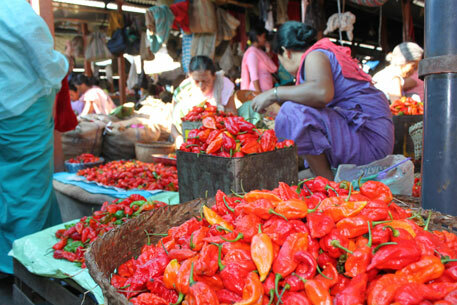 In places like Imphal, a single fresh chilli can cost up to Rs 5. But growing these chillies is not easy. Saikia says she would not have succeeded if it hadn't been for her determination. She and her husband started the chilli farm venture in 2004 and today supply the chillies to different parts of the world. But what has made it easy for the lady who is equipped with a masters in food technology from Mysore’s Central Food Technological Research Institute (CFTRI) is her desire to grow something different and experiment. The chillies need a lot of care. For one, they are quite disease-prone and need constant attention. If it rains, for instance, one has to ensure that there is no water logging in the farm for that would spoil the quality of the chillies. Second is the steep price of the raw materials. It’s expensive and difficult to speculate if it would yield enough fruits and be profitable. Leena shells out anything from Rs 150 to 200 per kg for the raw material. And to make one kilogramme of the dry chilli, one requires 7.5 kg raw chillies. That’s because of the high moisture content in the chilli. The Saikias supply over 25 tonnes of dried bhut jolokia around the world, her biggest market being the US which buys about five to 10 tonnes of the chillies annually from her. Another interesting thing about bhut jolokia is watching the harvest; it reminds you of the grape harvest in a vineyard with all its buzz and activity. There are two harvest seasons for bhut jolokia: one starts in May and lasts till end of August or first week of September. But this is mostly in the plain areas like Assam. The second harvest begins in September and goes on till January. This happens in hilly areas like Nagaland and Manipur. The chillies are hand-plucked by villagers who arrive in hoards during harvest. Once plucked, they are left to dry as they tend to spoil really fast. There are two methods of drying. The first is smoke drying, in which the chillies are spread out in a woven basket over the fireplace; sun-drying is not recommended because that can make the chillies lose colour. In the second and modern method, the chillies are kept in an oven for 24 to 30 hours at a low but constant temperature. It’s important to let the chillies retain colour and texture. The Nagas have found an interesting way to incorporate this chilli in their social life. In one of the annual Hornbill festivals usually held in December, organisers had a rather unique competition: raw Naga king chilly eating competition. And sure enough, there are far too many candidates participating in this event.